Varicose eczema, also known as venous, gravitational or stasis eczema, is a long-term skin condition that affects the lower legs. It's common in people with varicose veins. Varicose eczema tends to be a long-term problem. However, treatments are available to help keep it under control. There may be periods when these symptoms improve and periods when they become more severe. Your legs may become swollen, especially towards the end of the day or after long periods of standing. Varicose veins (swollen and enlarged veins) are often visible on the legs. Left untreated, leg ulcers can develop. These are long-lasting wounds that form where the skin has become damaged. See your GP if you have symptoms of varicose eczema. They'll often be able to make a diagnosis simply by looking at the skin. Your GP will also ask you questions to determine whether you have a problem with the flow of blood in your leg veins, as this is the main cause of varicose eczema. Your GP may also check the pulse in your feet and may carry out an ankle brachial pressure index (ABPI) test to see if compression stockings are suitable for you. See the section on treating varicose eczema for more information about these. The ABPI test involves comparing blood pressure readings taken from your ankles and upper arms. A significant difference in the readings suggests a problem with the flow of blood in your arteries – in which case, compression stockings may not be safe to use. Varicose eczema is usually caused by increased pressure in the leg veins. When the small valves in the veins stop working properly, it's difficult for blood to be pushed upwards against gravity and it can leak backwards. This increases the pressure in the veins, which can cause fluid to leak into the surrounding tissue. It's thought that varicose eczema may develop as a result of the immune system reacting to this fluid. Varicose eczema is more common in people with varicose veins, as these are also often a sign that the leg veins aren't working properly. 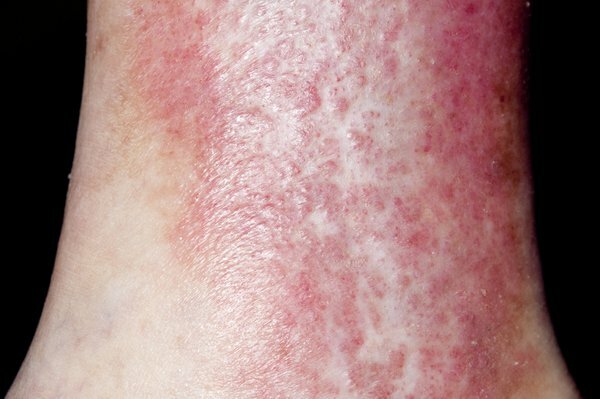 If these treatments don't help, your GP may refer you to a dermatologist (skin specialist) in case there's another cause for your symptoms or if they're concerned you may also have contact dermatitis. If you have varicose veins, you may be referred to a vascular specialist (a doctor or surgeon specialising in conditions affecting the blood vessels) who can talk to you about the treatment options for varicose veins. Read about treating varicose eczema.